The Mallard small, flying duck. 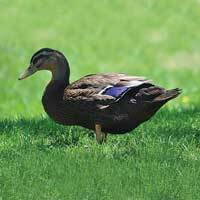 They are very similar in coloring to the Rouen duck, but are much smaller (weighing just 2-2.5 pounds). 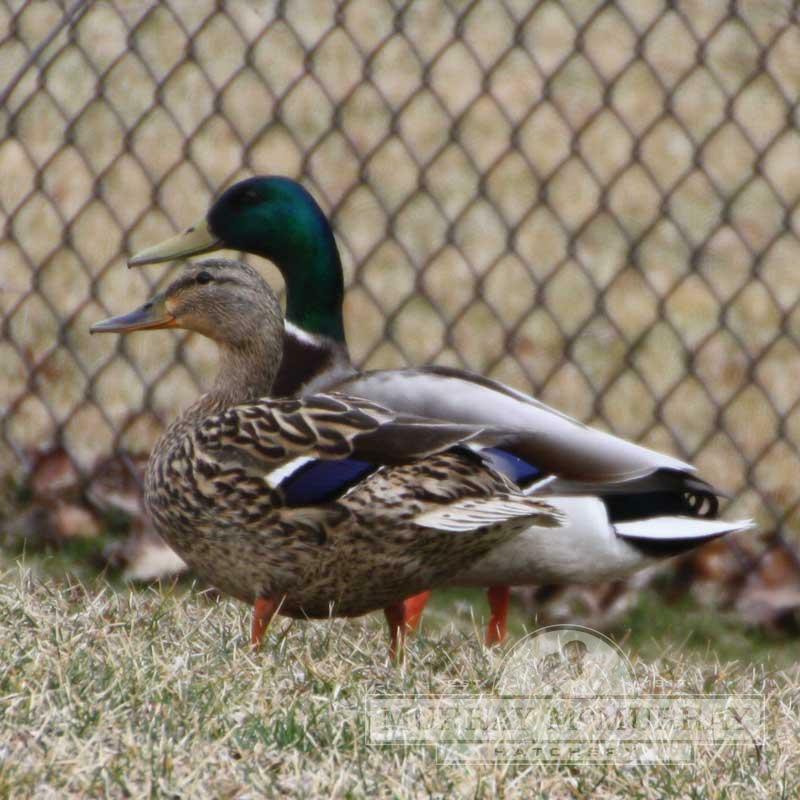 Mallards will start to fly for short spurts at 10-12 weeks, and will be flying well by 16 weeks. It is really a treat to see these brightly colored ducks flying about. 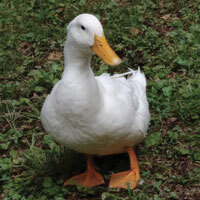 When raised for meat production, Mallards have a more gamey taste than other domestic duck breeds. Mallard hens are excellent mothers and will raise one or two broods of ducklings a year. 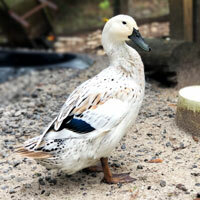 NOTE: We are unable to ship Mallard ducks to the state of Florida. Orders of 2-9 ducklings ship after April 1. A permit is not needed to own or sell Mallard ducklings. 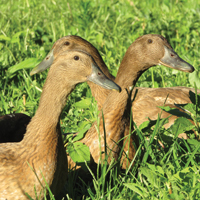 All domestically hatched Mallard ducklings are required to be identified by U.S. Fish and Wildlife. This is done by removing a back toe at the time of hatch — an method that is accepted by the U.S. Fish and Wildlife. You do not need to do any other marking of our Mallards at any time. This is to show, if you were ever inspected, that the birds were domestically hatched and not taken from the wild. What does 'straight run' mean? Birds that are sold as 'straight run' are not sexed and shipped 'as hatched'. We can not guarantee how many males or females you will receive in a straight run order. 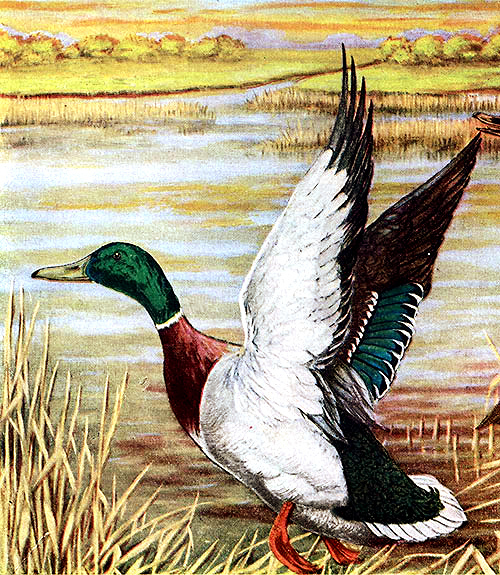 Do the Flying Mallards lay eggs? Yes, the females will lay eggs. Do I have to buy them as ducklings, or can I get them bigger? They are only available as newly hatched ducklings. When are they able to go outside to live/fly/swim? 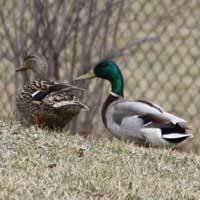 You want ducks to be mostly feathered — at about 6-8 weeks — before releasing them on to a pond. Do I need a permit to raise them? We suggest contacting your local DNR to find out for sure. When my Flying Mallards are old enough to go outside in my pond, will they try and fly away or do I need to clip their wings? Flying Mallards are wild birds. If you want them to stay on your property, you would need to clip their wings. It should be done every three months or so as the feathers will grow back. 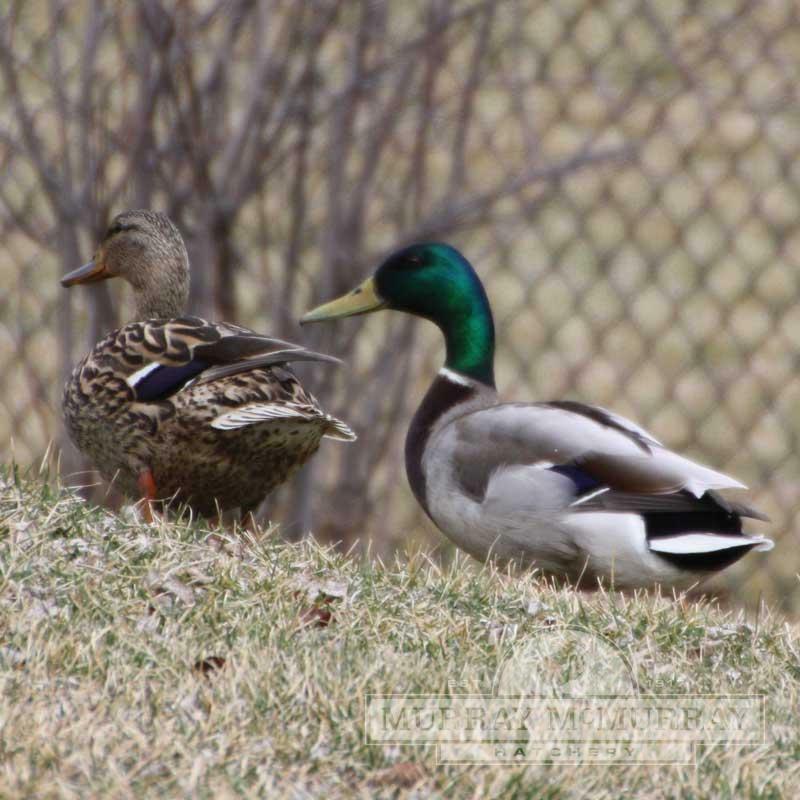 Will Mallard ducks continue to lay eggs year round? Ducks need a minimum of 14 hours of light to remain in egg production. You will need to supplement with a light in their coop for them to lay during the winter. MallardsIf you want a duck that will hatch and raise its own young, these are outstanding birds. I've also had Muscovies, which are also good setters and mothers, but I'd rate mallards above them. It's true that they are a lot smaller than other breeds, but in my opinion the ease in raising them more than makes up for that. I also found that although they can fly, when they are well-fed and well tended to they seem to lose a lot of their desire to do so. And it's my understanding that hatchery mallards have had the instinct to migrate bred out of them. Mine never showed any interest in the occasional wild mallards in the area. I had an occasional one fly out of an open pen. Never went anywhere, but never had the sense to realize if you could fly out, you could fly back in! The foolish bird would walk along the fence, frantically looking for a way in. Of course they would be easy prey in such a situation if you didn't catch them/herd them back in. But other than that, I really didn't find that they behaved any differently or were any more difficult to manage than other breeds. I ended up keeping mine in a pen with a top because there are so many hawks around. And they did fine, still producing plenty of babies! You don't get the benefit of them being able to forage, but I'd rather do that and have fewer birds than let them run and lose them to hawks.